Miyamoto Musashi in his prime, wieldin twa bokken. Widblock print bi Utagawa Kuniyoshi. 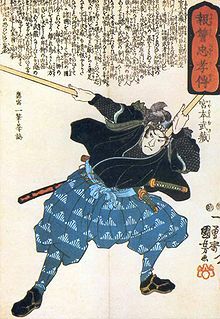 Miyamoto Musashi (宮本 武蔵, c. 1584 – Juin 13, 1645), an aa kent as Shinmen Takezō, Miyamoto Bennosuke or, bi his Buddhist name, Niten Dōraku, wis a Japanese swuirdsman an rōnin. ↑ Toyota Masataka. "Niten Ki (A Chronicle of Two Heavens)", in Gorin no Sho, ed. Kamiko Tadashi (Tokyo: Tokuma-shoten, 1963), 239. This page wis last eeditit on 19 November 2017, at 01:23.